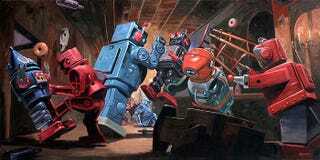 J.J. Abrams loves Eric Joyner's robot art, and so do we. The Bad Robot maestro is a fan of Joyner's paintings of tin robots in outer space, which inexplicably feature giant donuts. And Joyner's art will be featured as a backdrop in a new romantic comedy flick starring Abrams pal Greg Grunberg (the cop from Heroes) and directed by Lawrence Trilling (many Alias eps.) Joyner also has a bit part in the movie. Click through for a gallery of space-robots and donuts. The image "Robo Atlas" is a sketch for a painting which will appear in the Grunberg romantic comedy, which Grunberg co-wrote with fellow Heroes star David Anders (Kensei/Adam). I was born in the year 1960, in San Mateo, a suburb of San Francisco, CA. My childhood was fairly uneventful, doing the usual things most kids did, reading comics (mostly Mad, Creepy, Eerie & newspaper comic strips), playing sports, making gunpowder, and going to school, as well as drawing and painting. My father was atheist & my mother a Methodist...While my mother would bribe me with donuts to go to Sunday school, my father would take me aside & tell me 'Jesus is a crock of S_ _ _". Oddly enough they stayed together for over 50 years. I remember going to a huge Van Gogh exhibit as a child at the De Young in SF (and being very impressed) & taking painting lessons with my older sister at the local recreation center. Sometime in the first grade, classmates & teachers started to take notice of my work and eventually some of my paintings from the forth grade class, along with some other students work, were chosen for an extended statewide tour. In high school, I spent most of my energy dating, drawing, painting & working in a lumber mill to save up for school. After winning a few awards, I knew I'd be attending art school. So I left home (in Oregon) & attended the Academy of Art in San Francisco for four years. While there, I made a few friends & won some awards. Later, with influential teachers like Francis Livingston, Kazuhiko Sano, Bill Sanchez & Robert Hunt, my illustration skills improved & soon was getting a few advertising jobs during his last semester at the Academy (mostly pen & ink & school book assignments). During the recession of the early 1990s things were not going so good, not that they ever were really that great, in regards to my illustration career, So I took a computer animation assignment, not knowing mouse from a hole in wall...learning 5 programs at the same time & trying to meet deadlines may sound fun, but I don't recommend trying it. Anyway, after 3 months of torture, though the work was successful (Mavis teaches typing for kids) I chose not to pursue animation. The training was good though, & I still use some of the things I learned. A few years later, I took a job texture mapping for a CG movie & got to relive the learning/producing nightmare. The next job, doing backgrounds for Internet cartoons at Spunky Productions, for some reason, was not such a headache. I was prepared to do it the rest of my life, but like so many other companies of the dot-com phenomenon, the company folded. In 1999 I started to enter various juried shows at Artisans Gallery in Mill Valley, CA. & the work was well received. Shows in other galleries, (usually group shows) were positive as well. In 2000, after years of visualizing other peoples ideas, I made the decision to only paint things that I liked. Four series of paintings of different subjects were started; they were: San Francisco urbanscapes, paintings of old newspaper cartoons characters, Mexican masks, and last but not least, Japanese tin (toy) robots. Though all four series of these subjects were enjoyable to do, I chose to focus on the tin robots, as they were the most popular & seemed to have the most possibilities. So, armed with a small collection of tin robots & spaceships I began painting them in earnest. In attempt to bring them to life without losing their charm, I showed them where they belonged: outer space. By 2002 the paintings were looking good, but they still needed something to play off of... perhaps a nemesis. After a month or so of searching for a 'nemesis' I had an epiphany while watching the movie 'Pleasantville.' In one of the scenes, Jeff Daniels paints a still life of...donuts. With thoughts of Wayne Thiebaud's pastries always close at hand, it wasn't difficult to see the battle scene of robots retreating from 300-foot tall donuts when I went to bed that night. The rest, as they say, is history.